Caleb Rowden in the KBIA studios in April of 2015. 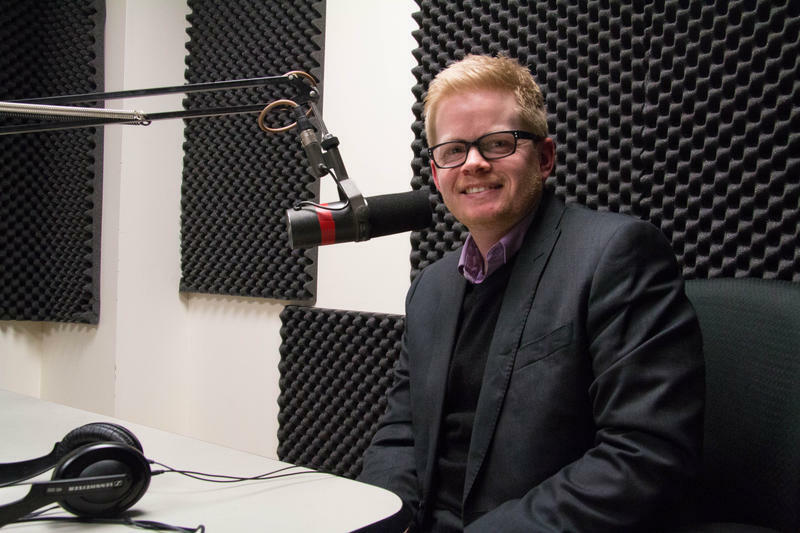 This week on Intersection, we talk with Caleb Rowden, the newly elected Missouri State Senator for District 19, which is made up of Boone and Cooper Counties. Rowden will replace two-term District 19 Republican Sen. Kurt Schaefer. We talk about Rowden’s tight race again Democrat Stephen Webber, healthcare, the University of Missouri, Planned Parenthood, ethics reform and his goals for the next four years. The race with Steven Webber for the District 19 state Senate seat was unbelievably hard fought and hard contested and won with just over 51 percent of the vote, and he had just shy of 49 percent. Why do you think that race was so close? Well, I think there are a number of factors and, you know, I think that we were both recruited candidates, good candidates and had built respectable profiles in Jefferson City, well known and pretty well respected in the community. I think the other piece of it maybe people in mid-Missouri are less aware of is that this was effectively the only contested general election Senate race in the state. So typically, you have three or four usually that are of of some significance in a general election, and so you know the resources from parties and things like that are split up three, four ways instead of one way and so Republicans obviously had held onto it, won it and then held onto it. Kurt was the first senator ever to be reelected in Boone county as a Republican, so we wanted to keep that momentum going. Democrats obviously wanted to take it back, so I think there are a lot of factors that made it into the race that it was. And the interesting thing about District 19 is that it's Boone County and Cooper County. So those are two somewhat different counties. Cooper's much more rural and Stephen actually won Boone County, and you won Cooper County, and your margin was such that you carried the district. Do you think it's possible to serve both the voters of Boone and Cooper County effectively and give them what they need? I absolutely do. I think one of the advantages that I had coming into the race was that my house district was effectively a mirror of the Senate district in that it was 45 percent outside of Columbia, about 50 - 55 percent inside the city. And so we had worked over the last four years, one to be very engaged in the rural parts of the district, you know, attend events and make sure folks know that even though I live in Columbia that I want to be a voice for them as well so that I think just being there is half the battle. And so we did a lot of that and I think there's a bit of an advantage there that I had in understanding how to campaign and how to help folks from Cooper County understand that even though I don't live here I know who you are, I know what you're going through, I've talked to you. And obviously, being in Columbia, you know we're very engaged here in the community, and so I think that was a little bit of an advantage that I had. I think, you know, there are pretty significant differences in some cases between Boone and Cooper, but in a lot of cases you know that their desires as it relates to wanting to make sure that our education system is world class and our communities are safe and the economy's growing, you know those are things that are universal certainly within Mid-Missouri. So that's what we focused on in the campaign and what we want to continue to focus on in the Senate. And in terms of the District 19 seat, it was also an extraordinarily expensive race. A lot of money was raised - I've seen it referred to as the most expensive race in the state. Why were both parties so keen to get this seat? I think again, it being one of the only places that money could have gone. You know, there was another somewhat competitive race in south St. Louis County, but we knew that this was going to be it. Nothing really in this race surprised me and probably not Stephen either. I think we both knew that it was going to be, you know, a pretty high-profile showdown. Again, Republicans, I think we needed to make a case. And this isn't a case that was Republican or Democrat specific, but I talked to a lot of folks and said: Hey look, you know, our Senator for the last six years has been the the head of Senate appropriations, which is an incredibly powerful position and and, you know, did a lot of things to fight back some budget issues with the university in 2009 and 2010. And so to go from that position to a Senator in, you know, an eight-person minority, which would have been a real problem, quite frankly, and --that wasn't something that I just said in the campaign. That's just the reality of the nature of where we are, you know, in the Missouri General Assembly, and obviously Columbia specifically. But mid-Missouri benefits a great deal from Jefferson City investing in our community and understanding the needs of university, of health care and some of those things. So it was important for a lot of reasons and I think Republicans and Democrats both saw that. Can you tell me how as state senator you'll keep working on corruption and reform? There are things that we can do and laws t hat we can pass that help in some ways. You know, some of the stuff that we've seen in the last couple years, were frankly just moral failures and poor decisions by individualized legislators that laws aren't going to fix. But I do think, you know, we've worked on -- we passed the revolving door bill last year that I think was a very small but important start to the process. It's the first piece of ethics reforms that's been passed Jefferson City in a long time. It didn't go nearly far enough as I wanted to, but we were faced at the end with the challenge of, the choice of, do we pass this or do we pass nothing, you know? And I felt like this was -- usually if I’m faced with that decision, I’m going to pass something, because I think more times than not that’s the right decision to make. We're going to file a lobbyist gift ban bill again this year, I've done it a couple of times. The Senate was kind of the problem last year, so hopefully being over there we'll have a little more opportunity to engage in a dialog with some of those specific senators, and let them know that 'Hey, you know if we have to pay for our own meal when we go out at night maybe that's not such a bad thing.' There are a few other things that we can do. I think I'm going to file legislation this year -- right now, legislators' emails interaction isn't subject to Sunshine law. I think that if we are going to require that of other public entities I think that's probably something that we should do. I'm not naive enough to think that...I don't know that it will pass in its first year, but I certainly want to start that conversation. So I think there are some things we can do there. And again, I tell this to everybody that I talk to about this. The vast majority of people that are down there are there for the right reasons. They're good people that are down there and serving because they love their community, and they love their state, and they are really excited about the opportunity to have the chance to make an impact in this way. But you know I think the nature of politics these days is that people don't trust politicians. And that's not always justified maybe, but I think that is the reality of the situation that we're in. So I think anything that we can do to be proactive, especially in a place like Jefferson City where it is a citizen legislature, we all have jobs, most of us have jobs outside, this is not our career, you're not talking about career politicians when you're talking about state representatives in Jefferson City. I think anything that we can do to bring government back to the people a little bit is a good thing. I'm always cautiously optimistic on this stuff, but I think every year that passes more and more people are made aware of: Hey, maybe we should do away with lobbyist gifts and we can move on to something else.